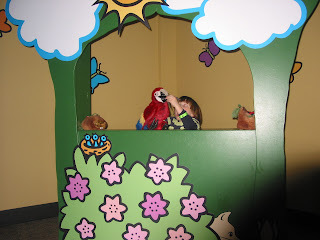 While at the children's museum, Trevy put on a puppet show. He called it "The Wild". 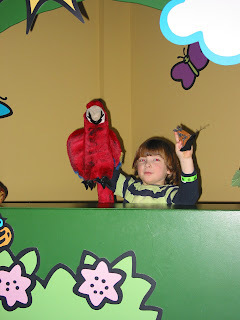 It was about a parrot, and a butterfly. 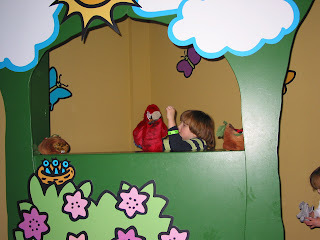 The butterfly was flying along, and all of a sudden, the parrot was swooping and gobbling! But Oh, Look! The beautiful butterflyhas gotten awy! It's been several days already! Trev has still been enamored with cartoon network, he really likes Foster's Home for Imaginary Friends, Ben Ten, Pokemon, and something else that I can't recall. He also watches Tom & Jerry. Quality television, I know! I'll keep my comments and judgments regarding this matter on the other blog, as that what it's for. Friday I ordered some fabulously fun supplies. And some nesting dolls for Maddie. I saw them, and thought, "Oh, they're wonderful, she'd love them," and thought I'd show them to her on the pc, and then thought, no, she wouldn't even know what they were on the computer, but I did it anyway, and she shouts "Dolls! !," and points to the computer. I pulled the page back up several times, and she'd shout and bounce, happy to see them every time. You know I was happy to get them for her after that! This post has taken me days to write, because of the pictures. Taking forever to upload them. Today we made a sand table outof a large shallow storage box, and placed it on top of another storage bin for height. Threw in some measuring cups and a few non-frozen sandbox toys from outside. Also got a few magnets from Home Depot, and some washers and very large machine screws. Trev played with the magnets for just a minute, and we discovered that we can pull them around through the kitchen table. And we discovered that we can make the magnet flip by putting the same sides (north to north), as it will repel and flip over to the attracting side. Yesterday I found some rubbing patterns of skeletons at the local school supply shop. I hope to play with them tonight to see if we can make some cool pictures. We'll see. Maddie is supercute lately, her favorite song is "Row, row, row your boat", she's trying to jump (not only off of furniture, but actually hop), and she is talking and talking, says everything. Today I walked in her room and she said "Hello!" with a big smile. I'm gonna eat her up. I think that's it. 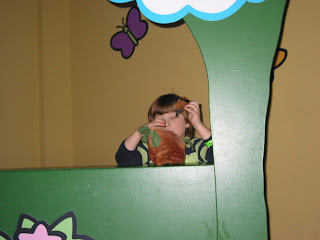 We may go to the Utah Museum of Natural History tomorrow night, as it's free on the first Monday of the month. If we do, I'll take some pictures.